The Pembroke Welsh Corgi (/ˈkɔːrɡi/; Welsh for "dwarf dog") is a cattle herding dog breed which originated in Pembrokeshire, Wales. It is one of two breeds known as a Welsh Corgi. The other is the Cardigan Welsh Corgi, and both descend from the line of northern spitz-type dogs (such as the Siberian Husky). Another theory is that Pembrokes are descended from the Swedish Vallhunds, which were crossed with the local Welsh herding dogs. The Pembroke Welsh Corgi is the younger of the two Corgi breeds and is a separate and distinct breed from the Cardigan. The corgi is one of the smallest dogs in the Herding Group. Pembroke Welsh Corgis are famous as the preferred breed of Queen Elizabeth II, who has owned more than 30 during her reign. Although these dogs have been favoured by British royalty for more than seventy years, among the British public they have recently fallen into decline in terms of popularity and demand. However, they remain very popular in the United States, where cities such as New York, Boston and Los Angeles hold annual "Corgi Meetups," in which hundreds of dogs and their owners congregate to spend the day. 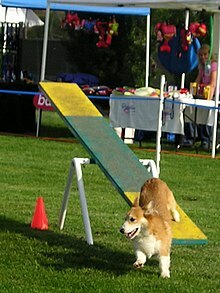 The Pembroke Welsh Corgi has been ranked 11th in Stanley Coren's The Intelligence of Dogs, which states that it is considered an excellent working dog. According to the American Kennel Club, Pembroke Welsh Corgis were ranked 20th most popular breed of dog in 2015. The Pembroke Welsh Corgi sheds extensively, often daily, with coat "blow outs" often twice a year. The Pembroke Welsh Corgi has erect ears which are in proportion to the equilateral triangle of the head. The ears should also be firm, medium in size, and tapered slightly to a rounded point. The head should be "foxy" in shape and appearance. Pembroke Welsh Corgis differ from the Cardigan Welsh Corgi by being shorter in length, having smaller ears, and being slightly straighter of leg. The Pembroke Welsh Corgi has a "fairy saddle", somewhat lighter markings on each side of the withers caused by changes in the thickness, length, and direction of hair growth. The Pembroke Welsh Corgi sheds mostly in the spring and autumn and may shed annually, with intact females shedding during heat. Breed faults exist; some which may acknowledge genetic health conditions such as "fluffies" which are corgis with very long coats, and "bluies," which have a dilute colour (red coats present with a bluish cast). Some Pembroke Welsh Corgis are born with their tail naturally short or missing. Others may have their tails docked between 2–5 days old due to historical tradition or in order to conform to the Breed Standard. Artificial docking was needed for the dog to do its job as a herding dog in the United Kingdom. A non-herding, "companion" dog was considered a luxury under tax law, and attracted a tax, so to demonstrate that their dogs were herding dogs, owners had to ensure the dogs had docked or bobbed tails. The Kennel Club, the United Kennel Club, and the FCI allow intact tails in Conformation shows. The AKC Standard states tails should be docked no longer than 2 inches (5 cm). In many countries, docking has been deemed illegal. The Pembroke Welsh Corgi lineage has been traced back as far as 1107 AD. It is said that the Vikings and Flemish weavers brought the dogs with them as they traveled to reside in Wales. As far back as the 10th century, corgis were herding sheep, geese, ducks, horses, and cattle as one of the oldest herding breed of dogs. Pembroke Welsh Corgis are closely related to Schipperkes, Keeshonds, Pomeranians, Samoyeds, Chow Chows, Norwegian Elkhounds, and Finnish Spitz. Pembrokes and Cardigans first appeared together in 1925 when they were shown under the rules of The Kennel Club in Britain. The Corgi Club was founded in December 1925 in Carmarthen, Carmarthenshire. It is reported that the local members favored the Pembroke breed, so a club for Cardigan enthusiasts was founded a year or so later. Both groups have worked hard to ensure the appearance and type of breed are standardized through careful selective breeding. Pembrokes and Cardigans were officially recognized by the Kennel Club in 1928 and were initially categorized together under the single heading of Welsh Corgis, before the two breeds were recognized as separate and distinct in 1934. Pembroke Welsh Corgis are becoming more popular in the United States and rank 20th (24th) in American Kennel Club registrations, as of 2015 (2012). However, corgis are now listed as a "vulnerable" breed in the United Kingdom; the decline has been said to be due to a 2007 ban on tail-docking (the practice of cutting off the animal’s tail) in the U.K., as well as the lack of breeders in the U.K. In 2009, the corgi was added to The Kennel Club's "At Watch" list of British breeds when annual registrations numbered between 300 and 450. In 2014, the breed was put on the Club's "Vulnerable Native Breeds" list when registrations dropped under 300. In 2018, the breed came off the "At Risk" list with 456 puppies registered in December 2017. The Kennel Club has credited the renewed interest in the breed to the popular Netflix television series, The Crown. At a young age, the Queen’s passion for this breed started when her father, King George VI, brought home their first royal corgi who was later named “Dookie”. The Queen ceased breeding corgis around 2012 so as not to leave any behind after she dies; her last corgi, Willow, died 18 April 2018. ^ a b c Wheeler, Jill C. (2010). Welsh Corgis. ABDO. p. 6. ISBN 1-61613-641-3. ^ a b c d e f Debra M. Eldredge (27 January 2009). Pembroke Welsh Corgi: Your Happy Healthy Pet, with DVD. John Wiley and Sons. pp. 21–. ISBN 978-0-470-39061-0. Retrieved 10 December 2011. ^ "Breed Standards : Pembroke Welsh Corgi - United Kennel Club (UKC)". www.ukcdogs.com. ^ "Pembroke Welsh Corgi - DID YOU KNOW?". Retrieved 28 January 2013. ^ "Queen's Diamond Jubilee: Just how many dogs does she own?". Retrieved 28 January 2013. ^ The Kennel Club. "Vulnerable Native Breeds". The Kennel Club. Retrieved 3 July 2016. ^ "MOST POPULAR DOG BREEDS IN AMERICA". Retrieved 17 August 2018. ^ Richard G. Beauchamp (1999). Welsh Corgis: Pembroke and Cardigan : Everything about Purchase, Care, Nutrition, Grooming, Behavior, and Training. Barron's Educational Series. p. 15. ISBN 978-0-7641-0557-9. ^ Debra M. Eldredge, DVM (25 February 2009). Pembroke Welsh Corgi: Your Happy Healthy Pet, with DVD. John Wiley & Sons. p. 17. ISBN 978-0-470-44364-4. ^ Debra M. Eldredge, DVM (25 February 2009). Pembroke Welsh Corgi: Your Happy Healthy Pet, with DVD. John Wiley & Sons. p. 70. ISBN 978-0-470-44364-4. ^ Eldredge, Debra M (2009). Pembroke Welsh Corgi: Your Happy Healthy Pet, with DVD. John Wiley & Sons. p. 17. ISBN 0-470-44364-2. ^ Richard G. Beauchamp (2010). Welsh Corgis--Pembroke and Cardigan: Everything about Purchase, Care, Nutrition, Grooming, Behavior, and Training. Barron's Educational Series. p. 19. ISBN 978-0-7641-4242-0. ^ Kennel Clun. "Pembroke Welsh Corg". Archived from the original on 14 June 2012. Retrieved 28 January 2013. ^ United Kennel Club. "Pembroke Welsh Corgi". Retrieved 28 January 2013. ^ Cathy Lambert. Getting to Know Poodles: A Guide to Choosing and Owning a Poodle. Animalinfo Publications. p. 15. ISBN 978-1-921537-06-6. ^ a b "Get to know the Pembroke Welsh Corgi". Retrieved 28 January 2013. ^ "2004 Purebred Dog Health Survey". The Kennel Club. Retrieved 16 August 2010. ^ The Dog Encyclopedia. Penguin. 2013. p. 59. ISBN 1-4654-2116-5. ^ "The Ultimate Guide To Buying A Corgi, Inc". Retrieved 15 April 2019. ^ "From the Genetics Committee of the Pembroke Welsh Corgi Club of America, Inc". Retrieved 28 January 2013. ^ E. Hywel Burton (18 October 2011). Pembroke Welsh Corgi. Kennel Club Books. p. 116. ISBN 978-1-59378-890-2. ^ a b "Pembroke Welsh Corgi - HISTORY". Retrieved 28 January 2013. ^ "AKC Dog Registration Statistics". American Kennel Club. Retrieved 17 August 2016. ^ News, A. B. C. (2015-02-09). "Dog Gone! Why You're Seeing Fewer Corgis". ABC News. Retrieved 2016-10-08. ^ a b c d "Corgis and the Queen: Celebrating the breed that the Queen made popular". www.thekennelclub.org.uk. Retrieved 2019-01-04. ^ "What Are the Queen's Corgis Called? All About Elizabeth II's Dogs". animalwised.com. Retrieved 2017-07-24. ^ "The Queen's Last Corgi Is Dead and the Internet Is Inconsolable". Time. Retrieved 2018-08-10. Wikimedia Commons has media related to Welsh Corgi Pembroke.